The WMIPEA1020 series offers 20 watts in a single output wall mount power supply with interchangeable plugs. All units are short circuit and over voltage protected. Output voltages range from 5 to 35VDC. Plugs come in United States/Japan (US), Europe (EU), Australia (AUS), and United Kingdom (UK) types. Plugs are sold separately so please contact factory for ordering details. requested. Please contact factory for ordering details. separately. Please call factory for ordering details. 3. 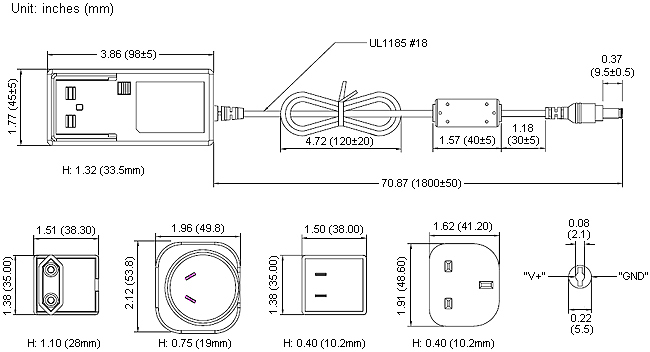 Other DC plug types and sizes are available. Please call factory for ordering details.